Offering you a complete choice of products which include ups 3200b panel saw machine, panel saw 3200a, panel saw ups 3200a plus and panel saw ups 3200 plus plus. The umaboy foremost manufacturer of wooden working machinery present the UPS 3200B Panel Saw Machine for our esteemed customers. 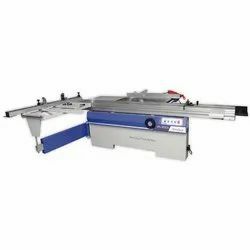 These machines makes the cutting of wooden, PVC, aluminum work piece easy during the any type of carpentry work. It has the very sooth sliding table which is known for its accuracy &rapid speed. The sliding table’s main spindle is having 4000 to 6000 RPM speed. There is a scoring saw having 8000 spindle speed has been provided to create the grooves on surface of work piece. This machine is suitable to cut Solid wood, Plywood, MDF board, Particle board & various kind of Laminated board. Compact and Rigid structure with high Precision performance. Can tilt 45degree for degree cutting. Extra support for wood sheet and high accurate cutting. High precision and long life sliding table for work.